I already discussed precious metal jump rings for maille, so this time let’s talk about the base metal rings. Aside from what they are made of, is there anything else you need to think about? In a word…yes! 😉 So let’s talk about the differences in base metal jump rings and precious metal rings. You probably are familiar with wire gauge, which is the thickness of the wire. For jewelry, the gauges most often used are 16, 18 and 20. So far so good, right? Well….there’s this little thing called standards for measuring wire. And the two main standards — AWG (American Wire Gauge) and SWG (Standard Wire Gauge) aren’t exactly the same for all gauges. OK, what does this mean anyway? It means that depending on the kind of jump rings you are buying, you may have to think twice about what you’re getting! When it comes to jewelry findings, you normally see things measured based on AWG. However, in the world of chain maille jump rings, you may also run into SWG measurements, which are thicker. Example: for a wire that is 18 gauge, AWG says it’s 1mm in diameter. However, the SWG measures it as 1.22mm in thickness. This obviously makes a big difference in AR, since 1.29mm is a size 16 in AWG. So the moral of the story is….know if the jump rings you are thinking about buying are measured as AWG or SWG. The most common base metals used in jewelry are copper, brass, aluminum, bronze and stainless steel. One thing these all share is that they are pretty inexpensive! But each metal has pluses and minuses, as you will see. Copper is a relatively soft metal, which makes it easy to manipulate in the thicker gauges. The two main ways you can get copper jump rings are “natural” (not treated in any way) and enameled. Enameled copper rings are colorful — just about any color you can think of is available. The down side is that since the enameling is just a surface treatment, it can be scratched. The bracelet you see to the right is made from enameled copper. Natural copper is lovely, but it does oxidize pretty easily so you’ll have to spend some time getting rid of the tarnish (lemon juice and/or ketchup works well). Stiffer than copper, brass comes in two main “colors”. One is regular brass, which has a bright yellow hue. The other is called red brass, which is a more golden color (not as “brassy”). The red brass is also sometimes called nu gold, jeweler’s brass and merlin’s gold. Brass also tarnishes easily, so keep that in mind. And also keep in mind that by the time you get to 16 gauge, the jump rings are going to be more difficult to manipulate. 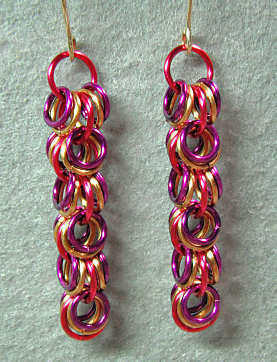 Aluminum is very popular for chain maille as it is both inexpensive and light. It also comes in a wide variety of anodized colors. (Reminder; anodization is a surface treatment and can be scratched.) Bright aluminum is a bright silvery color, and works really well. Just make sure you do not get regular aluminum, as you will get black rub-off all over yourself. I mentioned that the aluminum rings are lightweight, which makes them great for earrings. But if you like jewelry with a hefty feel, this isn’t the metal for you. On the other hand, it means that you can make something large and still keep it comfortable. For example, a dragonscale collar in silver would be on the verge of being uncomfortably heavy, while the same collar in aluminum would feel much lighter. Don’t confuse bronze the metal with bronze-colored. For example, there are bronze colors in enameled copper and anodized aluminum. But bronze the metal is an alloy of copper and tin. It has a reddish-gold color, and as you might imagine it tarnishes (because of the copper content). Bronze is a stiff metal, so once again it will be tough to manipulate in the heavier gauges. It can be a little on the brittle side if you over-work it. Really popular for men’s jewelry, stainless steel is heavy and has a nice shine to it. But don’t make the assumption that stainless or surgical steel are hypoallergenic, as they may not be – it depends on the amount of nickel used in the alloy. And it’s usually pretty tough to find that out. Steel is really stiff, and if you work in gauges thicker than 20 gauge, you’ll need heavier-duty pliers. Not to mention a few muscles! One more thing to think about is if you are buying these jump rings from a jewelry supplier is this: is the size of the ring based on the outside diameter or inside diameter. After all, an 18 gauge inside diameter jump ring is roughly an 8mm outside diameter. While a 6mm outside diameter is about a 4mm inside diameter. Biiiiiiiig difference! Now it’s time to talk about jump rings – materials, sizes and that dreaded term…aspect ratio. 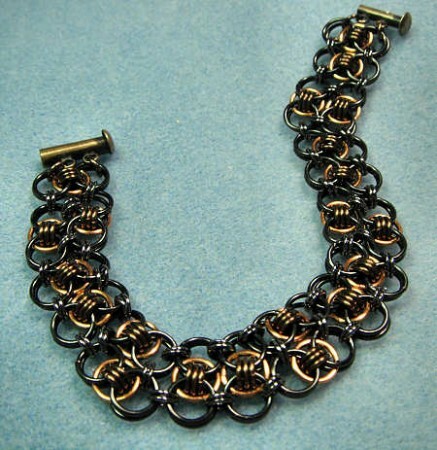 ‘Cause face it — without jump rings, there is no chain maille. When I started with making chain maille there wasn’t a huge variety of jump rings for use with jewelry. Most of the ring suppliers catered to the non-jewelry market. The jewelry supply stores sold rings based on outside diameter (OD), so you had to figure out the inside diameter (ID) yourself. Not to mention there wasn’t a huge variety of gauges, sizes or materials. Now things are all changed — we jewelry artists have access to all kinds of wonderful rings in loads of materials and sizes. Woo hoo! Chain Maille – Art, Science or Both? No doubt about it, maille is an art; all one has to do is look at the myriad items, jewelry or not. But there is also a scientific aspect to making maille, because for many patterns, you need rings of a specific size. That size varies according to the gauge of the wire. Yikes — head spinning yet? This relationship between gauge and size is called the aspect ration (AR). It’s a term guaranteed to make your eyes glaze over, LOL. However, it’s something you do need to know about if you want to maille. You don’t have to know the math, but you do need to know the AR (or know how to find it) for any given ring. For example, the pattern Jens Pind requires a very specific AR in order to work; it’s a very narrow range. Something like European 4-in-1 is a lot more forgiving, but it still needs a certain range of sizes in order to look its best. I wrote up an ebook (free) about AR, and it has a nifty chart in it that lists the ARs for some of the most common jewelry maille ring sizes and gauges. So here you go – chain maille rings. So yes, there is science involved — but when has science been this much fun? Ring Materials — My Precious…. When I was starting to maille (back in the stone ages I think), sterling silver was pretty cheap, so I mostly used sterling. Plus, it was one of the few metals that I could get rings for in a variety of ARs and gauges. These days sterling is not exactly cheap, but there are all kinds of other materials now so I am not too disappointed. While I still love silver, my heart has been wooed by colorful rings in aluminum, copper, niobium and titanium. That being said, let’s talk materials. 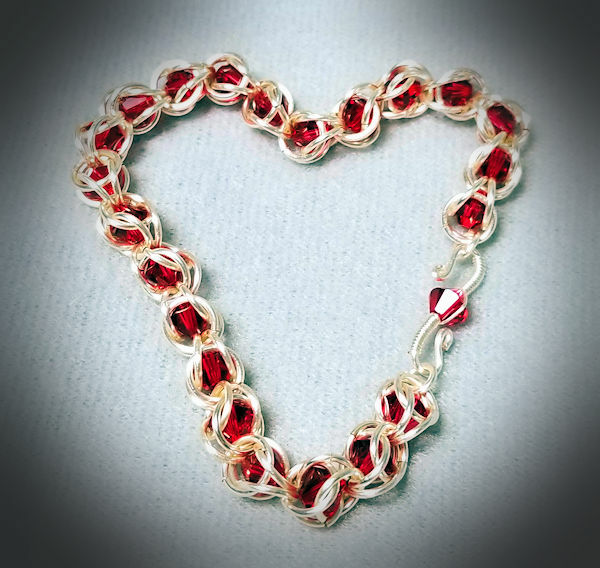 I’ll start with the metals classes as “precious” in chain maille terms – gold, silver, niobium and titanium. Gold is gorgeous, no doubt about it. It’s available in yellow,white and rose; as solid and gold-filled. Gold-filled is much less expensive than solid, and is a great alternative to the (sky-high) price of solid gold. And gold-filled is not the same as gold-plated. Plated rings have a thin layer of gold over a base metal core. Gold-filled on the other hand has a very thick layer of gold bonded to a metal core (usually brass). In terms of wear-ability, it’s just as durable as regular gold. Gold’s main drawback is price – even gold-filled is pretty expensive. However, you can still use gold as an accent, even if you can’t manage to make an entire bracelet or necklace with it. Silver comes in many forms – argentium, sterling and the new silver-filled. Argentium has the same amount of silver as does sterling; it just has different metals alloyed. Sterling includes copper, which is why sterling tarnishes fairly easily. Argentium doesn’t have copper, so it’s sometimes billed as “non-tarnishing”. It’s more accurate to say that is slower to tarnish. There is the new silver-filled jump rings out on the market. These rings are similar to gold-filled – same basic principle, except with silver. Niobium is a bit heavier than silver or gold, so keep that in mind when you are designing earrings. As far as price, it’s less expensive than silver, but more expensive than the base metals. Titanium is famous for being light and strong, but it’s also one of the hypoallergenic metals. Many people who can’t handle even niobium can wear titanium. It’s naturally a silvery shade, and it can also be anodized to other colors. As I mentioned, titanium is light. It can be good for earrings, but it could also be a “minus” if you like your jewelry to feel substantial. Price-wise, it’s about the same as niobium. I mentioned the term anodized in relation to niobium and titanium, but what is it exactly? It’s defined as a “process used to increase the thickness of the natural oxide layer on the surface of metal parts”. To put it more simply, a metal that is anodized has had a current passed through it, and that current changes the surface of the metal to a different color. Different currents produce different colors. Think of copper — when it oxidizes, it turns brown, green, gray, etc. Copper oxidizes from exposure to air and also from the chemicals in a person’s body. Anodizing is a little different in that it doesn’t happen naturally (like in silver and copper), and only happens with metals that are naturally reactive to the process. 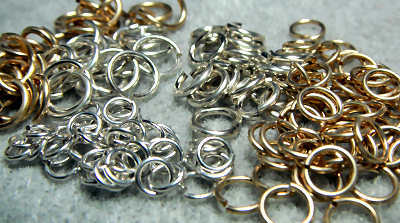 In the chain maille jump ring world, this means niobium, titanium and aluminum. I’ve already made this post long enough, so I’ll do a separate one for the base (i.e. non-precious) metals. See you later!